Smart Power Maps | Perfect Location. Maximum Profit. The need to move quickly in today’s highly competitive solar power development market means companies and developers must find new ways that give them a competitive edge. Enter Solar Power Maps – the most advanced software toolset dedicated to quickly and easily siting and accessing solar power projects for maximum revenue and profit. 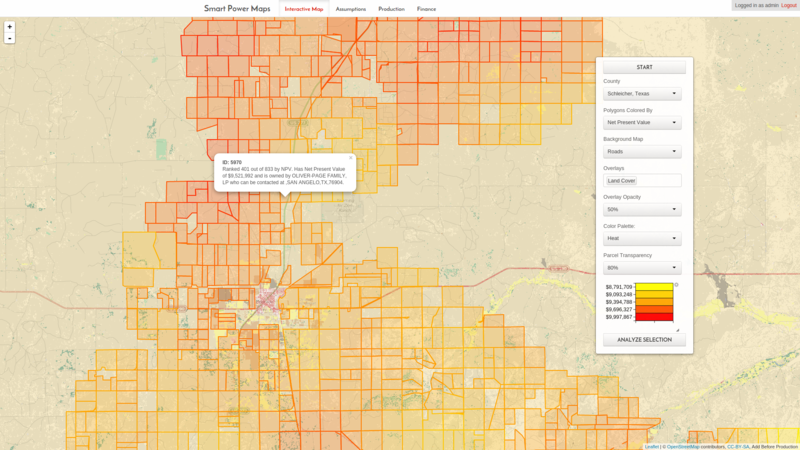 The Smart Power Maps cloud-based software toolset contains the most robust set of geospatial data specific to the solar industry. While the heart of the software is the robust geospatial data, the true power of the toolset is the advanced automated simulation capabilities. 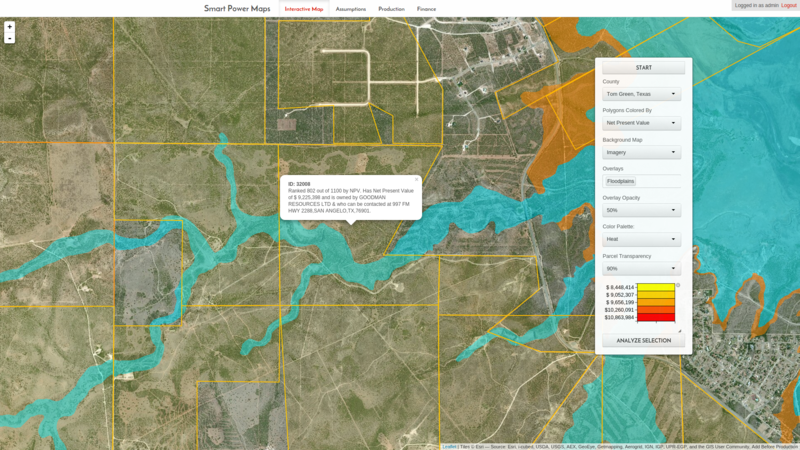 Powerful software doesn’t need to be difficult to use – Smart Power Maps follows that philosophy with a simple user interface and a highly-intuitive user fields. The combined geospatial capabilities create a software toolset that produces industry leading cost and time savings for solar power developers. 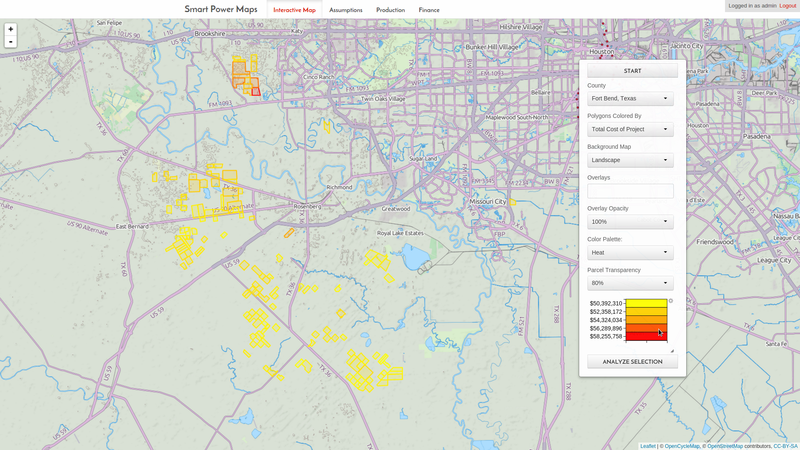 Siting and Assessing Solar Power Projects with Advanced Geospatial Mapping Software. Developers and investors siting projects or assessing projects can now assess and validate solar projects in mere minutes. Data for all layers are obtained and curated within the application to ensure the best possible information for your project assessment needs. 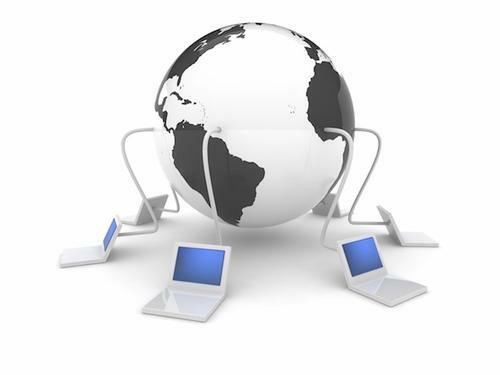 Simple user interface and a highly-intuitive set means users do not need any specific training in GIS. 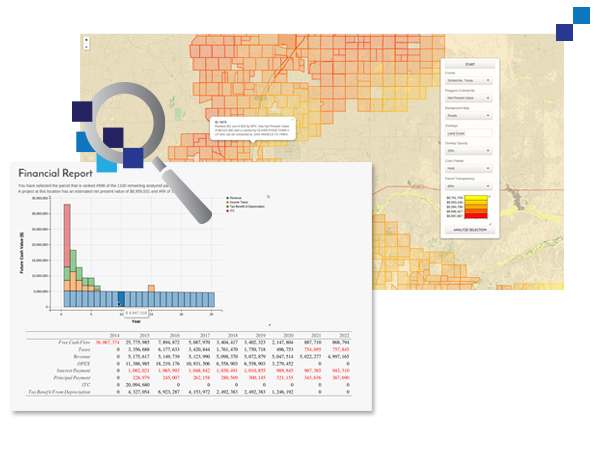 The Smart Power Maps cloud-based software toolset contains the most robust set of geospatial data specific to solar in the industry. Data for all layers are obtained and curated within the application to ensure the best possible information at any time. 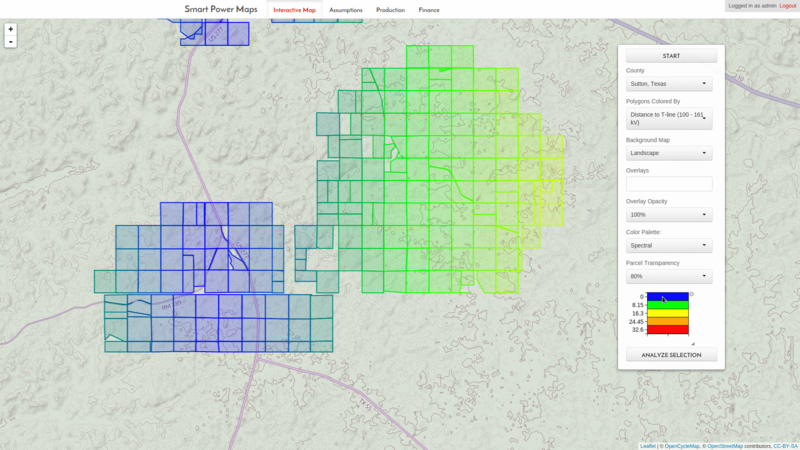 The true power of Smart Power Maps is its advanced automated simulation capabilities. The toolset allows the user to tweak their cost assumptions to immediately and easily rank which site or project provides the maximum profit against investment. Not only is the software easy to use, its advanced features reduce the siting and accessing timeline from 60 days to 60 minutes – saving significant development soft cost and greatly accelerating your project timeline. A value add in and of itself! 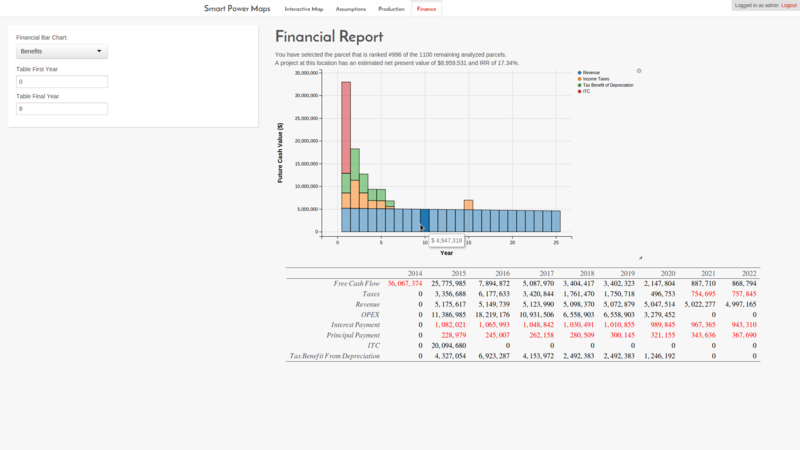 Smart Power Maps allows the user to select a parcel and run detailed production forecasts including full P90 and P50 simulations. 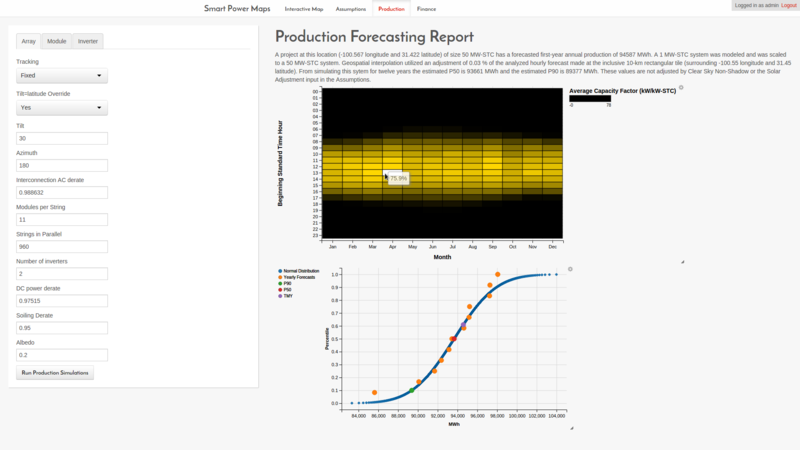 Even more, customers may run unlimited production forecasts without incurring any additional costs. The automated algorithms embedded in the software tool create a powerful cash flow analysis for any specified location, allowing the user to tweak their custom assumptions/parameters to immediately and easily rank which location provides the maximum profit against investment. If interested please use the contact form above providing your contact information and a bio providing your qualifications in the message box. We look forward to hearing from you.